Legions of Darkness is a solitaire, fantasy States of Siege™ game where you must survive the relentless attacks from ghastly creatures and monsters for three days and two nights - when reinforcements arrive. You are besieged on all sides by dark legions, with limited supplies and even fewer defenders to man the walls of Highmoor Castle. Make decisions wisely where and when to attack, how to marshal your heroes, what spells to cast, and which deadly traps to build at your castle. Pray your decisions will be enough against the hordes of undead skeletal riders, the giant armored orcs, and even the fearsome dragons that you must defeat until help arrives. With a little luck and plenty of the right decisions, can you withstand the siege? Defend your castle and survive the Legions of Darkness! Many gamers may not be familiar with Victory Point Games, so I feel compelled to offer a little background on my introduction to the company. I am a big fan of Space Hulk and (what is essentially the source material for Space Hulk) the movie Aliens. In my research before purchasing Space Hulk, I stumbled upon discussion of a game called Forlorn: Hope by VPG. I bought it, played it, and now have several more titles from the company, including this one, Legions of Darkness, which is strictly a solitaire game that plays in 45 minutes. Now to the details: The most important thing is that you have to know what you’re getting when you buy from Victory Point Games. The company is definitely not concerned with flashy components or the fanciest miniatures. In fact, a lot of materials look like they were done with a printer at someone’s home, and the cuts on the markers aren’t always lined up correctly. In addition, the whole game arrives in a ziploc bag, so when you get one, your first thought will likely be, “what the heck is this?” Despite the game’s presentation, the company does seem to be concerned with fun mechanics and gameplay, so if you’re willing to overlook the components, which may be difficult, you will find a great game waiting to be played. The basic idea for Legions of Darkness is that you are defending a castle from an onslaught of fantasy monsters. You have no hope of defeating these attackers, but if you can only hold out for three days, reinforcements will arrive, and you will be saved. The game is played on a map that includes the castle at its center, with five pathways for the attacking armies. As the defender, you have men-at-arms, archers, and priests, as well as five heroes with various abilities to protect your castle. The defenders can also use spells and castle upgrades to slow the advance, but again, there is no way to defeat them; you can only delay their advance or push them back. Each turn, a card is drawn that determines which armies move on each track, what events occur, and how many action and hero points the defender has for the turn. The action points are used to attack, build upgrades, cast spells, or restore your spells or divine energy. Additionally, some of the cards have quests that can attempted using hero or action points. The number of action points you have is affected by morale, which drops at each dawn. The cards also serve to advance the time track, and there is a separate deck for daylight and night. At night, the fifth track, the terror track, is used, but these armies retreat when the night ends. Overall, the game does a great job of presenting a tight, quick, solitaire adventure. From the start, you never have enough points to do what you want to do, so you are constantly forced to make tough choices, and the decisions go a long way towards making you feel as if you are caught in a hopeless struggle, just trying to hold out a little longer. Admittedly, the components can sometimes prevent the player from being truly engaged, but the theme plays well despite this. If the game came with a large cardoard map, thick markers, and detailed miniatures like a typical Fantasy Flight product, it would likely sell many more copies and would be recognized and appreciated by a much larger collection of gamers. Unfortunately, because of the way it is presented, a lot of gamers will be unaware or unwilling to play it. Anyone willing to overlook the components and give this one a try will find a well-designed solitaire game that is lots of fun to play. 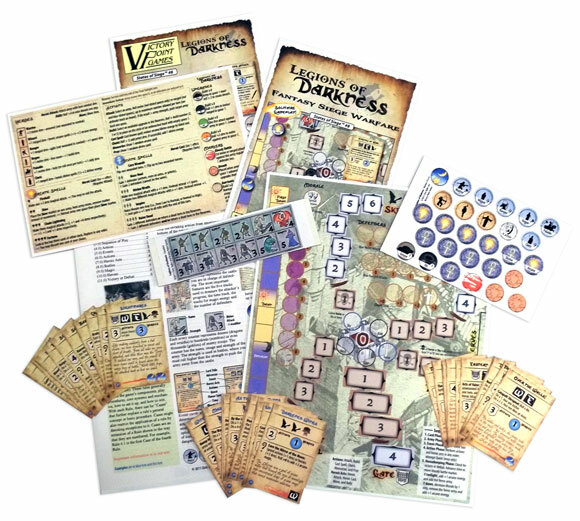 Legions of Darkness is a solitaire game in which the player takes command of a fortress and must survive a siege by fantastic monsters until reinforcements arrive. Each turn, a card draw dictates the actions of enemy forces, any bonuses or penalties in effect for the turn, and possibly an opportunity for a side quest. The player has limited actions with which to counter-attack, upgrade his defenses, prepare and cast spells, and more. There are just enough options and limitations that you will usually need to make a tough choice regarding your priorities for the turn: attack the weakened army, or the closer one? Fight a bloody battle, or give ground to save your troops? Spend your energy on the spell you have, or wait and try to get the spell you want? Replayability is not bad. I found the greenskins scenario quickly became too easy, but the undead scenario remains challenging. The heroes, spells, and event cards are interesting and quite distinctive, but you can see around 3/4 of them in a single game, so they become familiar after a few plays (there is an expansion that helps with this). As with Victory Point Games’ other products, the components will not impress, but neither do they stand in the way of great gameplay. Overall, this is a small but challenging solitaire game, and so far my favorite in the States of Siege series. Add a Review for "Legions of Darkness"